WORCESTER, MA – The Worcester Railers Hockey Club (@RailersHC), proud ECHL (@ECHL) affiliate of the New York Islanders (@NYIslanders), and Railers HC General Manager and Head Coach Jamie Russell (@JamieRussell18) officially announced today their exhibition game schedule in preparation for the Railers HC home opener on Saturday, October 20 at the DCU Center vs. the Maine Mariners. 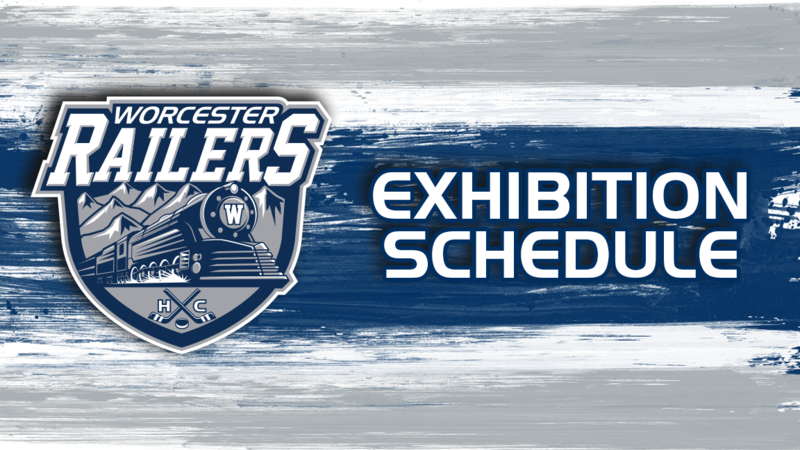 The Railers will kick off the 2018-19 season exhibition schedule with an inter-squad blue vs. gray game on Friday, October 5 from 6-8pm at the Fidelity Bank Worcester Ice Center. Worcester Railers HC members are invited to attend for free. Worcester will play an away game vs. the Maine Mariners on Saturday, October 6 at 7pm at the Rinks at Exeter in Exeter, NH. The game is open to the public and free of charge. Training camp for the Worcester Railers begins on Monday, October 1. The complete training camp schedule, along with the camp roster, will be announced at a later date. The Worcester Railers HC 2018-19 home opener at the DCU Center is Saturday, October 20 vs. the Maine Mariners. All tickets are now on sale. For season memberships, flex packages, and group tickets contact the Railers HC front office at 508-365-1750 or by visiting www.RailersHC.com.